It turned out the Mat (of Full Court Press fame) was there to give a demonstration of the machine at a public event that evening. Sadly I couldn’t stay, so Mat gave me a one-on-one demo ahead of the event. Because he’s Mat, and he’s nice like that. In what follows, please bear in mind that I have not had a chance to play with the Decent Espresso machine myself. 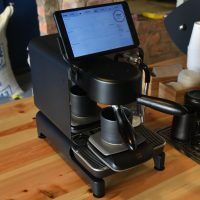 Unlike my piece on the Sage Barista Express, where I had the machine at home and used it extensively, here I am merely reporting what I have seen/been told. However, what I did see was pretty impressive. I’m not going into the technical side to any great detail, although I’m aware that there’s quite a lot of really interesting mechanical and electrical engineering going on under the hood. Partly this is because I’m not really qualified to say what’s what and, perhaps, more importantly, while I do care at a technical level, I care much more at a practical level whether it works or not. So, with those caveats out of the way, what did I actually find? Well, you can read all about that after the gallery. Mat had turned up at The Good Coffee Cartel with a fairly standard-size wheeled suitcase which he’d brought with him on a flight from Bristol. I’m now kicking myself that I didn’t take any photographs as he started unpacking it, because that in itself was a thing of beauty. The case folded out in two halves and inside, packed in perfectly-cut Styrofoam, was the Decent Espresso machine. In a matter of minutes, Mat had taken it out, assembled it (not that there was much assembly required), plugged it in, put some water in the reservoir, and was pulling shots. That, in itself, was impressive. The machine is roughly cubic, and, I’d say, about the same size as my Sage Barista Express. However, whereas my Sage has a built-in group head, the Decent Espresso machine has the group head extending out from the front of the box, which gives it a slightly smaller footprint (in reality, it takes up roughly the same space, but it certainly feels smaller). There’s a handle which screws into the group head, a clever addition which gives you something to hold onto as you attach the portafilter. Without it, there’s a danger that as you twist the portafilter into place, you could twist the whole machine with the torque. The handle helps you hold it in place. There’s a bespoke mounting on top for the tablet, although there’s no reason you couldn’t mount it somewhere else if you want to, or, indeed, carry it around in your hand if it takes your fancy. The whole construction is pretty solid and the machine is well-built with smooth curves. Perhaps the best parts are the water reservoir and drip tray, which are made of heavy-duty ceramics, giving it a really sold feel. The reservoir slides in under the machine, which is raised above surface level by four sturdy feet. The drip tray, meanwhile, slides in in front of it. The water intake tube drops down from the machine into the reservoir. To slide the reservoir in and out, you simply lift up the tube using a lever at the back. Filling the reservoir is also very easy: just slide out the drip tray, partially slide out the reservoir, pour in the water, then slide it back in. The only obvious problem I can see with the design was pointed out to me by Mat. The power socket is at the back and takes a standard kettle lead. However, because the machine draws a lot of power, the lead has to be pretty thick, and, as such, Decent Espresso has been unable to find an angled connector. As a result, the power cord extends a good 10 cm from the back of the machine, meaning that you can’t mount it flush to the wall. I wonder if a future variant will have an option for a side-mounted power socket? So that’s what it looks like. But what’s it like in action? Find out after the gallery. I watched while Mat dialled in the machine. Everything is controlled from the tablet and, while I didn’t get to play with it myself, the interface seemed pretty straightforward and intuitive. One of the nice features is the large number of languages it supports. Another is its compatibility with a set of scales, which link by Bluetooth to the tablet, giving you an extra level of control. Note that the scales are sold separately, and, as far as I know, it is only compatible with this specific make of scales. The Decent Espresso machine has three basic modes operation: espresso, steam and hot water. In its simplest operation, all the parameters are set, and the entire operation can be controlled from a single screen, with one button for each operation. Simply press the relevant button and off you go. The tablet software has a variety of skins which determine the appearance of this basic mode. You want your buttons to look like Aztec Gods? No problem. As far as I know, presets are supplied, so if you never want to tinker with the settings, you won’t have to. On the other hand, you would be missing out on Decent Espresso’s most powerful feature: everything Is configurable! Via a series of settings screens you can control pre-infusion and extraction, including water temperature, pressure and flow-rate. You can set limits, such as extracting for x seconds, or, if you have the scales attached, you can stop the extraction as a certain weight. These settings aren’t just single numbers, by the way. You want to play with pressure profiling? Go for it. For example, you can set the extraction to start at 9-bar and drop down to 6-bar over a period of 30 seconds. A similar level of control applies to the steaming, although there are obviously fewer parameters. However, you can set the steam temperature and programme it to steam for a set length of time. So far, so good. However, the best is yet to come. It’s one thing to set these parameters, but the Decent Espresso machine has sophisticated sensors which measure the actual temperature, pressure and flow-rate in the group head. When you hit go, moving graphs show you the actual values achieved against the target values you’ve programmed. These are displayed in real-time and can also be reviewed afterwards, which allows you to troubleshoot your shot with a high degree of precision. Overshooting on pressure, but not achieving your flow-rate? Maybe you need to move to a coarser grind. Once you have perfected your recipe, you can save the settings, the tablet’s interface allowing you to give each recipe a name, along with space for notes, etc. In the short time I had observing Mat, it seemed pretty comprehensive and within 20 minutes he was pulling decent shots. Although I didn’t get to play with the settings themselves, I did get to pull a shot and can confirm that it’s incredibly easy to use with the basic set-up. Even I managed to pull a decent shot! The verdict? Well, without actually have one and using it for days on end, it’s hard to say definitively, but it seems to live up to the promise. It certainly is incredibly flexible and gives you a high degree of control, probably more control that I would want or need. On the other hand, the graphs and numbers appeal to the geek in me, and I could see me endlessly experimenting, recording my results on endless spreadsheets. In closing, many thanks to Mat North for the impromptu one-on-one session, to The Good Coffee Cartel for hosting and to John and Decent Espresso for the factory tour back in Hong Kong. December 2018: Decent Espresso has won the 2018 Most Popular Coffee Spot Award.